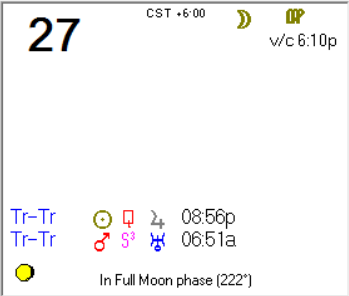 Wednesday is similar to Tuesday: a very lunar day with the Moon in Virgo. The morning starts as a straightforward workday followed by a glitch or two here or there. Once past these we have smooth sailing into the evening. An opportunity may come to you late Wednesday afternoon; seize it. To be sure, it will require work, and it may not be entirely straightforward. It will not be a HUGE opporunity but something shorter term. Still, it is likely to be worthy of pursuit. Moon turns v/c at 6:11 PM CST, so fully seize the opportunity before then (and lock it in) or forgo it altogether and spend the evening cleaning house.